On my recent trip to Berlin for Tech.Ed I was really impressed with the performance, stability and ease of use of the latest 3.06 Beta of Ovi Maps. I’d used it a little before the trip and knew it was pretty good and that it could work offline. I though that might come in handy in Germany where I my T-Mobile pay-as-you-go SIM wouldn’t roam. 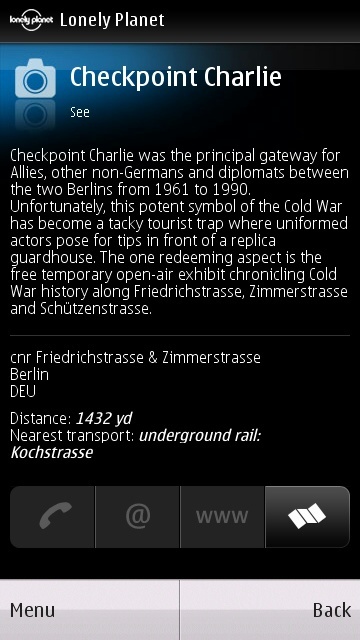 So before I left San Francisco I loaded the Berlin/Brandenberg map set to my N8 using the Map Loader in Ovi Suite. I was actually dreading using Map Loader as I’d experienced a lot of frustration with older versions of it when loading maps to my N95. Plus I’d never used Ovi Suite before. Until I got the N8, PC Suite had worked quite well for me. I felt no need to switch to Ovi Suite, which I’d heard was bloated and slow. PC Suite doesn’t support the N8 however, which left me no choice but to use Ovi Suite. Downloading and installing Ovi Suite took a while but once installed it was actually perfectly usable and responsive on my new, but entry level, $400 laptop with Intel T4400 processor and 3GB RAM. I fired up the map loader and was pleasantly surprised to see that I had the option to download just the 34 MB of Berlin maps I that needed rather than all 400MB of Germany or 3GB of Europe as I remembered having to do in the past. The download took only a few minutes. As expected, I had no voice or data service with my T-Mobile prepaid SIM when I arrived in Berlin. My first order of business was to get a local SIM. 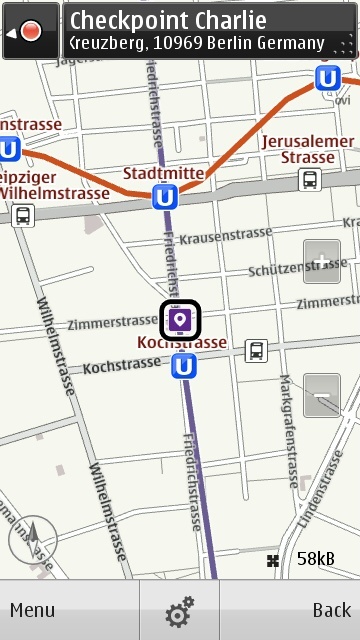 So I had my cab driver drop me off on Tauentzienstrasse, a major shopping street near my hotel. I got a Fonic SIM pretty quickly but it required activation on the Fonic desktop site, which would have been pretty difficult standing in the street even it I had data, which I didn’t. I needed to get to my hotel and fire up my laptop. I could have taken a cab there, which was convoluted kilometer away, but opted to walk using Ovi Maps to guide me over the unfamiliar Berlin streets. Before I left San Francisco, I added my hotel’s address to my Ovi Maps Favorites using the Ovi Maps website and downloaded it to my phone with Ovi Map’s sync feature. So I opened Maps, clicked the entry for my hotel in favorites and choose “Walk To”. 10 minutes latter I was at to the hotel’s front desk. It was so easy with Ovi Maps and was something I couldn’t have done with Google Maps, which requires a connection to do anything. I did a bit of the tourist thing in Berlin with WOMWorld/Nokia‘s Rhiannon, Mike Maddaloni (thehotiron.com) and Craig Richards (geekcomputers.co.uk). We used Ovi Maps to find our way about with the confidence that, data connection or not, we could always find our way back to the hotel. I never want to travel anywhere again without something like Ovi Maps. 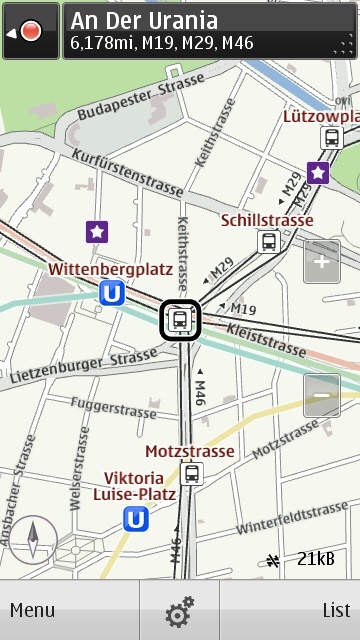 Another feature of Ovi Maps that we used in Berlin are the bundled free online services, which do require a connection of course. From any map page you can tap icons for Lonely Planet, TripAdvisor or Insight Guides to get listings for nearby sights, hotels, events and restaurants. Or tap the weather icon for a five day forecast for your current location. 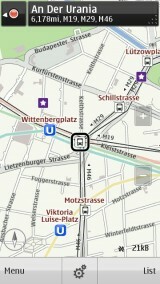 The latest 3.06 Beta version of Maps from Beta Labs adds a lot of new features including a transit line overlay. There’s no transit routing yet but it does shows subway stations and tram stops and the lines connecting them (image, top right). Mike and I used the transit and walking feature to find our way to the U-Bahn to take us back to the hotel after leaving the jumping HTC party on our last evening in Berlin. 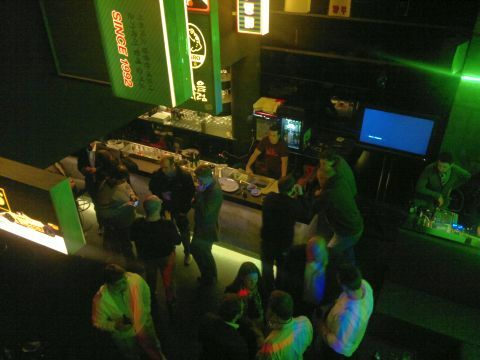 Speaking of parties, Rihannon, our awesome host in Berlin, snagged us invites to an exclusive Nokia party in a black cavern of a bar behind the The Angry Chicken, a non-descript, but edgy, Korean fried chicken take out joint whose slogan is “So, so Angry“. I think we were the only non-Nokians at the party. Which was great as I got to to chat with Sebastian, Joseph and Lee from the Ovi Maps team which is headquartered in Nokia’s Berlin office. They showed me some neat Maps tricks and let me in on some of the new features they are working on for future releases. Particularly exciting to me was the news that Maps will be getting public transit routing and the ability to download complete map sets directly to the phone over the air. Both of these are huge for global wanderers on a budget. Should you suddenly find yourself in Paris, Tokyo or Rome you will be able to load a map set for the city to the phone over your hotel WiFi and use it for off-line routing and for planing trips, including trips on public transit. As someone whose preferred way to explore new cities is on foot and by transit this is great news. Ovi uses vector maps which provide much smaller and faster map downloads and faster and smoother zooming and rotation than the tile based format used by Google and Bing. While there are third party off-line maps apps on other platforms like MGMaps for mobile Java or Locus for Android, only Ovi can do offline navigation because if stores not only the maps offline but also an address and point of interest database. Which means that even without a data connection you can search for a address and navigate to it. 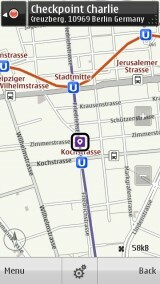 Ovi Maps is an absolute winner for Nokia. Symbian may have a few warts but Ovi Maps is by far the best mobile mapping and navigation solution out there. Offline mode is amazing. I’d really like to see Nokia promote it more. Ovi Maps is included for free on many Nokias, including low price point models like the T-Mobile 5230 Nuron which is a $99 prepaid offering from US retail chain Costco. Not only is Ovi Maps included in the price of the phone but lifetime free map and POI updates are too. A big thank you WOMWorld/Nokia for sending me to Berlin for Tech.Ed, a trip I never could have made on my own. WOMWorld covered everything; airfare, hotel, meals, drinks, and admission to the conference. I had an amazing time thanks to Nokia, WOMWorld, my fellow bloggers and traveling companions and especially Rihannon from 1000Heads/WOMWorld, who handled every detail including setting up interviews with key Nokia people, invites to a couple of parties and a great traditional German meal! You can see my photos of the trip (shot with a Nokia N8) on Flickr. 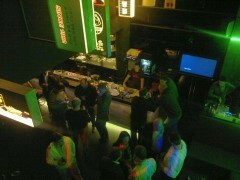 This entry was posted in Events and tagged Nokia, Ovi Maps, tee10, WOMWorldNokia by Dennis Bournique. Bookmark the permalink. Speaking about killer nokia apps. Nokia labs has some rather interesting ones such as nokia situations, like ovi maps, it seems pretty unique. Also you’d want to fix your desktop site. What’s wrong with my desktop site? What URL? Very true. Alot of people pay high prices for Blackberry’s just for the BBM app which i find weird cause there are alot of free alternatives which are just as good and way more open and cross platform such as Mxit but there is really no substitute for Ovi Maps. The offline feature simply rocks and won’t be found anywhere else unless you buy a specialist navigation device. The rest of the application is pretty good too with numerous views to choose from and many other tools to find places to eat, stay and visit when you in unknown territory. If there’s one app that you should buy a device for, it’s Ovi Maps. But the map should rotate when when you flip the phone from portrait to landscape. Pino from the Ovi Blog here. I’m glad you loved the evening with Nokia (btw, the name of the bar is Soju Bar, not Angry Chicken which is the Korean take-away ^_^). And I’m very happy that you like Ovi Maps! 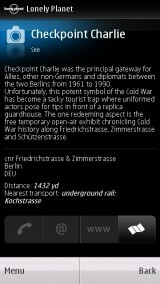 Ovi map’s use even in offline mode is really excellent feature. Both cost wise and in network unavailable areas. A doubt i have, is there any way i can load maps directly to mobile bypassing ovi suite? I’m afraid of it’s size. The maps on that site are not compatible with recent versions of Ovi Maps. You’re right, we can do a better job of promoting the offline capabilities of Ovi Maps. Thanks for the feedback and for sharing your experiences with Ovi and the Nokia N8.